Knowing what we know now about history, the time has come to create new relationships. We can all help. With the rise of Idle No More movement, we are even more aware of the injustices and inequities that continue to face our aboriginal brothers and sisters. There are a disproportionate number of aboriginals in our prisons. Too many of their children are in foster care. Too many in the aboriginal community live below common living standards. Reconciliation is a process between individuals. This important work will be done on the ground, one person and one group at a time. We owe this to ourselves as members of the human family. We owe it to ourselves as Canadians. We owe it to future generations to do what we can to make this right. Go to Reconciliation Canada http://reconciliationcanada.ca to see how you can get involved in the events during Reconciliation Week and beyond. 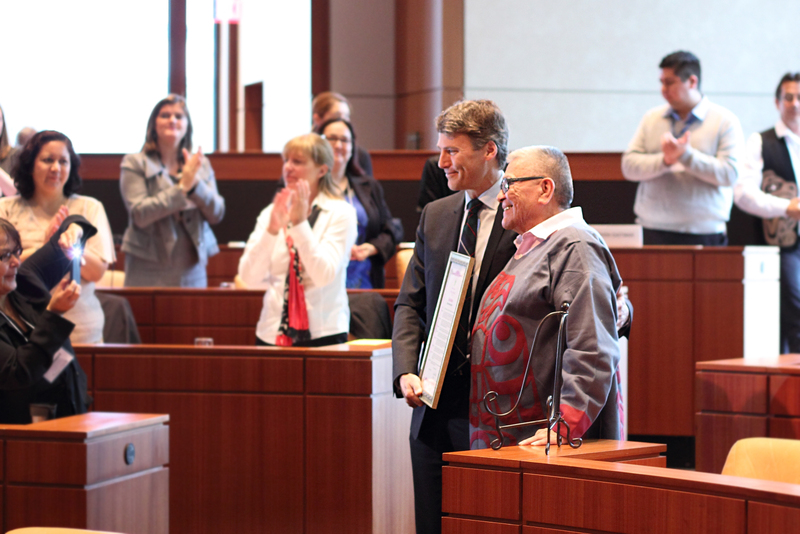 On June 20, I was privileged to attend a special summit during which Mayor Gregor Robertson announced that June 21, 2013, to June 20, 2014, would become the “Year of Reconciliation” in Vancouver. Also present were many city councilors, government representatives, prominent First Nations leaders, and others from community groups in the city. At the June 20 event, we heard the landmark proclamation read publicly. Looking back at Vancouver’s history since its settlement in the 1850s, it appears we have come a long way from our racist beginnings. Throughout the 20th century, as in the rest of Canada, Vancouver displayed, “hate-motivated violence towards racial or ethnic minorities”. For example, in 1907, “a mob of whites attacked the Chinese and Japanese communities, causing at least extensive damage to stores and, it was claimed by one report, ‘several fatalities'”. This riot brought shame to the city. It was driven by the Asiatic Exclusion League, which was formed to keep Oriental immigrants out of B.C. Forty years later, in 1947, the League was behind another major downtown rally against people of Chinese and Japanese descent. It started with rock throwing and window smashing and grew into a gun battle. Police invoked martial law for 10 days afterwards. This happened only two years after the end of the Second World War where Canadians had fought and died; a war where the genocide of millions of Jews and other ethnic groups and nationals took place and racism was a driving force. As well, during the war many Japanese Canadian residents in B.C. were forcibly taken from their homes and their possessions confiscated. They were interned all over Canada. Even though Canada considers itself a relatively peaceful country, behind the scenes there has historically been much racism directed at individuals. As unpleasant as it is to remember the tragedies of the past, the legacies of these gross injustices are all around us today as the survivors of these schools, their children, and their families live among us. Fast forward to June 20, 2013, in a large room in downtown Vancouver where the mayor and his council are asking citizens to create dialogue with local First Nations people, to pay attention to the stories of those who experienced these profound violations, and to encourage Vancouverites from all walks of life to share in the conversation. Chief Robert Joseph is a hereditary chief of the Gwawaenuk First Nation who grew up in Alert Bay, a community on Cormorant Island. 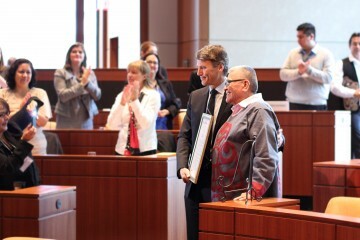 He has been instrumental in building bridges between the aboriginal community and others to encourage a dialogue on reconciliation in Vancouver and Canada. He was at the June 20 event to speak on behalf of Reconciliation Canada and receive the proclamation. As I watched the proceedings, it struck me that Robert Joseph’s journey has been a long one. How could he ever have imagined during his traumatic experiences at the residential school he attended near Alert Bay, starting at six years of age, that he would one day be standing in harmony with elected leaders of a major municipal centre and speaking the language of reconciliation. Chief Joseph has come a long way from the experiences of that little boy in St. Mary’s School more than six decades ago. While the ceremony for Vancouver’s Year of Reconciliation was very moving, I came away with the notion that the work is just beginning. Each of us can and should make an effort to join in this conversation. We can all take action on many levels. Here are some events people can participate during Reconciliation Week, which takes place from September 16 to 22. September 16: The lighting of the sacred flame to commence the Week of Reconciliation. September 17: The All-Nations Canoe Ceremony, taking place from Kits Point to the Olympic Village. People-powered crafts will join traditional canoes in a welcome ceremony to Coast Salish lands. September 18 to 21: TRC B.C. National Event at the Pacific National Exhibition. Witness the proceedings; come share and learn the truths about Indian residential schools. September 22: Walk for Reconciliation (from the Vancouver Public Library to Creekside Park) and the New Way Forward Celebration. Participate in the walk, join a group, or create one. The events will bring Canada’s many cultures together in a shared commitment to reconciliation. The Year of Reconciliation will continue to be enhanced by interactions between the aboriginal and wider community. Are you part of a community group of any kind—faith, non-profit, arts, sports, business, or otherwise? See if you can come together for a dialogue with our fellow aboriginal residents in Vancouver through Reconciliation Canada. Sharing stories is a powerful healing tool. Get in touch with them for more information. The racism of one human against the other has been in existence through history all around the world. With colonization, indigenous people everywhere suffered grave injustices including the loss of land and their way of life. All of us can relate to being a stranger in a strange land when we lose our bearings, our relationships, our homeland, or our health. It is all that more poignant when indigenous people feel like they have become strangers in the lands of their ancestors. Celia Brauer is a staff member and co-founder of the False Creek Watershed Society. She is presently attending University of British Columbia.